Milestone, a leading provider of digital marketing software and agency services for hotels, retailers and financial services companies, announced today that its CEO, Anil Aggarwal, was recognized by Owler as a Top-Rated CEO in Silicon Valley. Owler looked at 167,000 CEOs on Owler to identify the top 1,000. 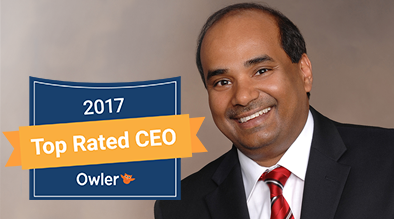 As one of the awardees, Anil is among the top 0.60 percent of executives on Owler, putting Milestone at the pinnacle of business leadership alongside leaders from companies such as Salesforce, LinkedIn, and Netflix. Anil ranked #19 amongst the Silicon Valley CEOs with a score of 97.1. The awards provide a true market view of the best-loved leaders across 50 cities and 25 industries worldwide. “I am honored and humbled by this award,” said Anil. “An award for the leader is truly an award for the entire team and our customer community because the leader is merely the reflection of the team. I also want to thank our employees and our customers who enable us to perform miracles every day. Silicon Valley has very good quality teams and companies, for Milestone to garner this award is a big “milestone” everyone should enjoy.” Anil has served as CEO of Milestone for 12 years, transforming it into a digital marketing powerhouse. 2017 Owler Top Rated CEO Awards provide a complete market view of a CEO’s rating, which includes ratings from employees, competitors, followers, and general Owler users. CEOs are rated by members of the Owler community. Owler analyzed those ratings and distributed 1,000 awards to the highest rated CEOs from over 167,000 CEOs on Owler. “These winners are truly the best of breed: they beat out the other 99.4 percent of leaders on our platform to win a coveted 2017 Owler Top Rated CEO Award,” said Jim Fowler, CEO at Owler. Congratulations to Anil and everyone at Milestone. Milestone is a leading provider of digital marketing software and services for hospitality, retail and finance. We provide a full range of solutions including website and mobile design, content creation, SEO, analytics and competitive intelligence. Our best in class technology and solutions drive revenue and ROI for clients across the globe. Over 2,000 companies do business with Milestone, including leading hotel chains, major retailers and financial services companies. Milestone has garnered over 300 awards and a reputation for blending outstanding design with advanced technological capabilities. Milestone is one of Silicon Valley Business Journal’s fastest growing companies and is an Inc. 5000 company. Owler is the world’s largest community-based business insights platform that business professionals use to outsmart their competition, gain competitive insights, and uncover the latest industry news and alerts. Owler is powered by an active community of 1 million business professionals who contribute unique business insights such as competitors, private company revenue, and CEO ratings. From startups all the way to large enterprises (including 96% of the Fortune 500), CEOs, salespeople, marketers, product managers, and all types of business professionals use Owler daily. Home Milestone Inc. Receives 2017 Best of Chicago Award	Is Your Slow Hotel Website Costing You $100K Per Year Or More?